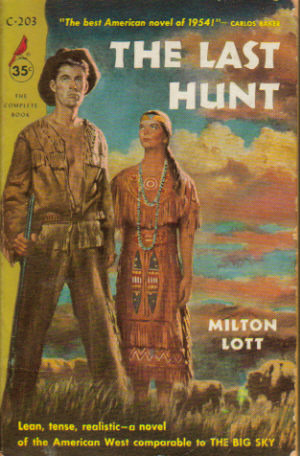 Born in 1916 and raised in the Snake River Valley of Idaho, Milton Lott began working on THE LAST HUNT in college as part of a class taught by George R. Stewart(whose EARTH ABIDES ranks among my favorite books). It was finally published in October, 1954 when Lott was thirty-five. The first novel received a citation from the National Institute of Letters and Arts. Apparently the publisher, Houghton Mifflin, liked it so well they granted him their Literary Fellowship Award to enable him to complete it. 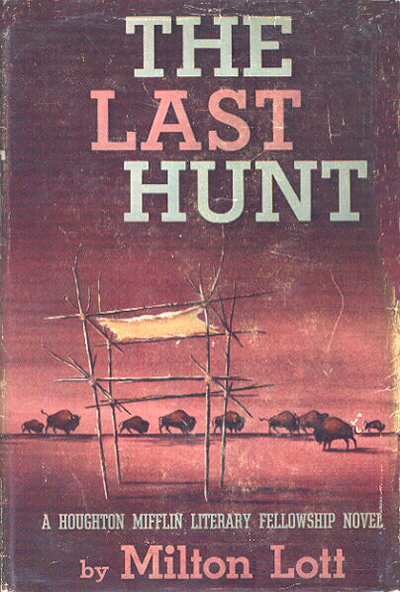 THE LAST HUNT is set near the end of the vast period that decimated the buffalo herds and the tale is centered around two men, Sandy McKenzie and Charlie Gilson. McKenzie is a former buffalo hunter, now owning a small cattle herd built from his savings, and Gilson is a obsessed gunman with a hatred of Indians(I make the choice to use the unpopular today sobriquet as it was a novel of its time). The pair meet one night during a violent thunderstorm that had startled a herd of buffalo, which proceeded to wipe out the cattle herd and destroy Gilson’s outfit. Both virtually wiped out, they pool their few resources left and form a partnership. They re-outfit and hire two skinners, old Woodfoot(so named by Indians because of his hand-carved, by himself, wooden leg complete with foot) and young Jimmy O’Brien, a half breed with brick red hair. Woodfoot is not a big fan of skinning, but it’s a living, and drinks a lot. Skinning is new to Jimmy as, raised among his mother’s people, had always hunted from horseback and skinning was, after all, woman’s work. Though loathing buffalo hunting now, McKenzie knows no other way to build up a stake. It doesn’t take long before he realizes that Charlie, while good with guns and despite claims, has never hunted buffalo before. He doesn’t know the proper way to cull the herd without alarming the rest. But he learns fast and things go well at first. But when four Indians steal their mules, his bias really begins to emerge. Charlie goes after them with a vengeance, shooting them down from a distance with his buffalo gun and entering the camp. he hears a wail and finds one of the women was only winged by his bullet and she has a small child. He takes her back to the camp and she and the baby become “his.” But not before skinning one of the Indians he shot, intending to tan the hide and make something(he never follows through). When Sandy shoots one of the rare white buffalo, Charlie figures it will fetch a high price. Two Indians, young and old, happen by and try to buy it. Charlie is amused by it all, driving the price up until he forces the young man into a gunfight for the hide, knowing all the while he’ll kill the fellow. Things change from that point. Charley treats the woman bad, smacking her around, using her frequently, even trying to force her to fletch and tan the hide of her man. The baby is terrified of him. Sandy watches it all and does nothing. Not afraid of Charlie, he just believes it’s none of his business. But things change. the kinder, gentler Sandy begins to feel an attraction and the baby warms to him as well, Charlie sees this and can’t understand why it doesn’t work for him. You know somewhere down the line…. Lott’s novel is unsparing in details of the lonely and brutal life of a buffalo hunter, the hunts themselves. He knew how to weave all this stuff in without slowing the story. I found myself drawn in, almost like I was there, with descriptive details of the herds, the dust, mud, blood, the weather. I especially remember one scene where Charlie was cleaning his gun, hot after so many shots(often downing a hundred before breaking), holding it with his gun belt and “making water” down the barrel. Interspersed throughout the narrative are flashback bits that develop the men Sandy and Charlie are in the present. There’s even a few for Woodfoot and Jimmy. THE LAST HUNT was made into a film in 1956 with Stewart Granger as Sandy and Robert Taylor as Charlie. Taylor is especially noteworthy in capturing the obsessive gunman’s love of killing and hatred of Indians. Lloyd Nolan is old Woodfoot, Russ Tamblyn is Jimmy, and Debra Paget is the Indian woman(never named in book or movie). The first half of the movie follows the book pretty close, but from the arrival of the woman and her child, the story is almost totally new. Director and screenwriter Richard Brooks changed so much, toning it down for the times I suppose.All the buffalo shooting scenes were filmed at the annual “thinning” of the herd at Custer State Park in South Dakota. I liked it as well as the novel. hum, sounds interesting. I have not heard of the book or movie but will give it a search. How lovely to have support for your work that early on. Thanks for the good review. I’ve been curious about the book, I really liked the movie.